This is Draft 2015-05-07-01 of John Tigue's architectural overview of the SEANetMap project. The other documents in this set can be found in the index. On Thursday, 2015-05-07 this document was migrated into the project's wiki. Feedback can be given (and is most welcome, email such to john@tigue.com). The version are named with the pattern DATE-SERIAL, where DATE is of the from YYYY-MM-DD and SERIAL is a two digit code, reset to 0l each day. For example, 2015-05-04-01 is the first release of May 4th, 2015. A very rough draft, published simply to announce that work was proceeding on it. First version worth even reading. Represents a brain-dump by John Tigue after wrapping his head around the complete project scope, and not scope. SEANetMap is a join project between M-Lab and Code for Seattle with the goal of developing a liberally licensed, open source codebase for citizens to run broadband network performance tests and compare their results with what other people are experiencing across the area and network providers. The aggregate results dataset is to be publicly available as a social good for further analysis, yet provided in a fashion that respects concerns regarding personally identifiable information. Initially, the project will be specific to Seattle, yet it is a goal to make the codebase reusable for deployment in other localities. This document is an architectural overview of the project. Even though SEANetMap is a not-for-profit open source project rather than a commercial product, it is intended to be quickly consumed by non-technical end users at a decent volume of traffic. As such it may well be wise to not go further out on any more technology limbs than is required. Consider a 2015-03-30 article, entitled Choose Boring Technology, which councils caution regarding the explore-versus-exploit trade-offs implicit in architectural choices. Basically, the article provides a list of self-check questions for any architect. "Let's say every company gets about three innovation tokens. You can spend these however you want, but the supply is fixed for a long while." This mindset has guided the choices as described in this document, at least for the first major release which is all this document is concerned with. Further, the market is rapidly responding to the need for a full ecosystem around NodeJS. In terms of business "social proof" evidence of NodeJS being full-scale ready for prime time web infrastructure consider recent developments out of two of the biggest cloud providers. M-Lab has certainly provided all the basis code needed for a modern looking web site to act as a client of M-Lab's NDT test service and aggregated test results data. In M-Lab's terminology, the codebase that Code for Seattle is working on is called a "portal." The main goal at this time is to build out a Seattle specific portal. Yet it is very clearly a longer term goal to have a codebase which can easily be deployed by other localities. The Seattle specific site will be useful for Seattle, but might best be viewed as the "pilot system" version 1.0 as we warm up and learn what reusable code will look like and what feature it will have. For example, how will it be white labeled, re-skinned, localized, etc. Simply the above two goals with a fully fleshed out dev and deploy process is the current milestone being aimed for. Achieving that would be significant: a new project off the ground, on its own terms, with deployed client and server code. Yet from a longer term perspective that really is only Step One. Although clearly we know where we want to go roughly, many details need to be fleshed out. The site is somehow arrived at, which will at least be a link from http://seattle.gov. Optionally, during the session the user may preform a network performance test against M-Lab servers. Registration should be possible with various levels of anonymity, and users should be able to identify themselves more AND less later if they wish. Registration enables a user to run multiple tests over time across multiple session and the site will be able to show the user a time series plot of their test results. There needs to be a dialog wherein users can identify their broadband provider. Automatic provider detection is technically possible but is out of scope for now. Manual is sufficient, and even if automatic were built out, there are still cases where the user would want to override that. Clearly this should not be hardwired into HTML. Whether it comes out of a config file or a database it yet to be determined. M-Lab servers are running the tests in terms of performing as NDTP servers, and they store the results of the test. SEANetMap triggers the test and its web pages host the UI for the test. This provides SEANetMap a hook into the workflow so that it can persist its own information about test run. For example, if a user is logged in and wants to see their previous test from other sessions, then SEANetMap needs to maintain that list of tests. Therefore, it needs to persist to storage the identities of tests run so that the specific past test results can be queried of M-Labs. The initial 1.0.x UI for the test will be based heavily on the example provided by M-Labs. The test report visualizations will be the main value of this project. There are many possibilities, some are listed here. For 1.0.x only the basics are being aimed for. In particular any reports which require charts may be punted on. This may seem harsh but simple map reports are happening first as M-Lab provided code for such. Charts will happen second. They will be implemented in D3 and D3-based charting libraries such as C3.js. But "This portion of the project has been taken up by brett. (Data Visualization)"
"combines the functionality of the 'traceroute' and 'ping' programs in a single network diagnostic tool." This will hopefully be part of the site but the code is not in the main codeforseattle/seanetmap repo yet. This code base is Python but there is really no Web server besides use of the venerable SimpleHTTPServer for dishing up static files. So, any static files needed by his code will be served up by nginx. Somehow there will need to be scheduled process which kicks off this Python code to generate new route maps, but this will be very similar to how bq2geojson (NodeJS) is scheduled and drops into an external process to actually do the heavy lifting of talking to Google's BigQuery. Note that Miller's code is Python code. So this is not a direct re-implementation of mtr functionality in the browsers, rather it maps out the network from a server. There might still be a possibility of a mtr-js but that is out of scope now and we do not even know if the WebSocket API provides control of TTL which would be need to make it happen. There should be multiple layers to the map. [X] Hex tiling of city. For a user to configure the map view they are interested in (in terms of which layers to have rendered), there will need to be a basic layer switcher control. Various existing codebases are used in the project. Here is a list of known current dependencies. Leaflet: for mapping. There is no competition. Mapbox: Also for mapping. It is currently in the code base. Have not figured out what it is being used for. Mapbox is heavily based on Leaflet. The Leaflet lead dev now works at Mapbox. Bookstrap: Pretty standard for base UI stuff these days. To keep things feeling fresh, the settings need to be tweaked to be somehow not the defaults. jQuery: will it ever go away. Why does it persist? It is in the code base. D3: Used in the NDT performance test UI. Later it will be used for various charting (say, C3 or custom). NDT (natch): this is the NDTP client which does the WebSocket work horse nitty gritty. At its core SEANetMap is a NodeJS application. In this diagram broadbandtogether.com is simply a dummy deploy site; SEANetMap will be deployed many places, including firstly by the City of Seattle. In production deploy contexts NodeJS apps live behind reverse proxies, which in this diagram is nginx. SEANetMap serves up the user experience via a web server front end. regularly builds maps by querying M-Lab for its historical test results stored in Google Big Query. Results should be caching of course and only new results queried for. Results are cached locally as CSV files. Both of the above hit M-Lab for data, one for routes and one for network performance results. The web app is NodeJS-based. The main framework is Express. Static content should be hosted on a CDN. There should be a front (nginx) and a Node supervisor. This is rather undefined at this time. A SQLite database is initialized but it is not known at this time what is being done with it, if anything. Main issue currently is codeforseattle/seanetmap#4. per-nilsson is on this front: "I'll take this on. Will store JSON in a text column in a sqlite database for now." As of [2015-04-23], DB set up is documented in the README. Mongo is used for this as well, although recent releases of PostgreSQL make it less important. We really don't know what data will be stored beyond what M-Lab keeps. They intentionally do not store PII, while that may not be a concern in this project, especially if we very clearly ask the citizens for permission to store PII. There are two pieces of technology from M-Lab that are interesting for the purposes of SEANetMap acting as a client to M-Lab: bq2geojson and Telescope. The former is Node code so it would seem to be a natural fit for SEANetMap, while the latter is Python code but is more mature code, lower level, and broader in scope. It would seem that both will be used. A Node command line tool for extracting data from M-Labs and plotting it in GeoJSON, one GeoJSON map per month. "A tool to (relatively) easily convert M-Lab BigQuery data into hexbinned GeoJSON files and files necessary to make functional maps. "This is small Node.js application which aims to make it relatively easy for just about anyone to fetch M-Lab data from Google BigQuery and convert it into a format (GeoJSON) that is easily usable by mapping software, Leaflet in this particular case." So, good that it is Node based, and it is very specific about what it does: make GeoJSON from M-Lab queries. And it is already tested with Leaflet, which the project uses. "You will also need to have the Google Cloud SDK installed"
a childprocess is kicked off use Google's bq CLI util for fetching a month's data as CSV. the file is converted from CSV to GeoJSON. Turf is used to hexbin the data. The result is a set of static files, GeoJSON, one for each month requestd. The files sent from the server to the client, if they are actually GeoJSON then this seems like an excellent place to deploy TopoJSON. Hexes should be "compressable" about 6:1::GeoJSON:TopoJSON As is the files do seem to load rather slowly but that could be a number of issues. https://github.com/m-lab-tools/telescope Telescope is a Python library by M-Lab for querying their Google BigQuery datastore. This could be a way SEANetMap gets data out of M-Lab and stored locally. The project's wiki already has a page of M-Lab related information, which will not be repeated in this document since this document itself is to eventually be a page in that wiki. 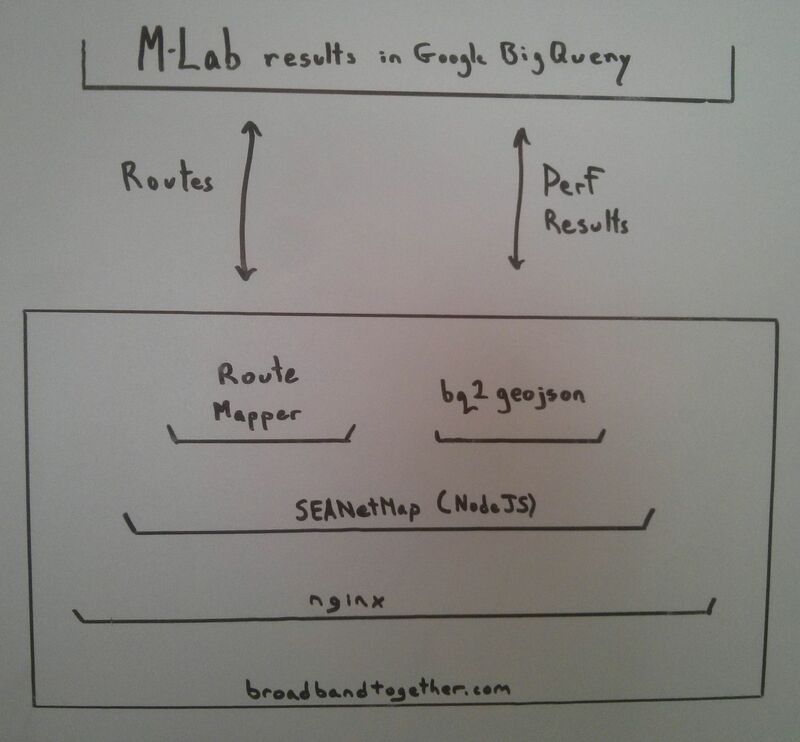 SEANetMap is only a client of M-Lab's data. It does not tightly integrate with M-Lab servers and data store. NDTP tests are run against M-Lab server (for setting up and managing the test and pumping test data through pipes). The bulk of the test result data is stored in M-Lab. SEANetMap stores additional information, linked to the tests, in its own datastore. This includes PII which is intentionally not gather by M-Lab for reason relating to privacy concerns in the context of intrusive governments in certain parts of the world. seems NDT results are stored in table by yearmonth. But again, it might be something for later when there is enough data to have a smooth heat map. Nonetheless, it is not critical or base simplicity so it is off the list for 1.0.x. If things go amazingly well, perhaps this could be a stretch goal. M-Lab stores route information (Paris traceroute) gathered during the NDTP tests. This information includes identifying information of the various routers that the TCP/IP packets pass through between the test client and server. Point being, from the "qwest" info from DNS, this is a CenturyLink customer. It would be very nice to pre-set a users ISP details based on such trivial look-up conclusions. This is out of scope for 1.0.x. The user will have to identify their provider manually, initially. Post 1.0.x the code will be segregated into containerizable components suitable for deployment via Docker. A Dockerized architecture is a good target for maximizing re-deployability, which also encourages a microservices architecture, which is a natural fit for this project wherein a SEANetMap server has to work with M-Lab's separate servers over HTTP. It would be nice to do this for 1.0.x but time is very tight so there will have to be a refactorization later. This actually is not such a bad thing because the project is so nascent that the structure is still being explored. Long term though this is a goal.